Just before the sun rose on Saturday March 9th, we began our journey to visit our artisans partners across Guatemala. After waiting out some flight delays, making our way through customs, and sitting in bumper-to-bumper traffic from Guatemala City, our crew of 3 Living Threads Co. team members and 4 GW graduate students had finally arrived in Antigua. Once we bathed off the grime of travel, we all convened in town at a traditional Guatemalan restaurant for a hearty dinner and to discuss our goals for the next week. After having sorted out some scheduling issues, we called it a night and headed back to our hotels to prepare for our departure the following morning. Amanda Zehner (Founder & CEO), Amalia (President of Tinte Maya Artisan Cooperative in San Juan), Isa (Translator), and Stacy (GW International Development Graduate Student) discussing the week’s schedule. 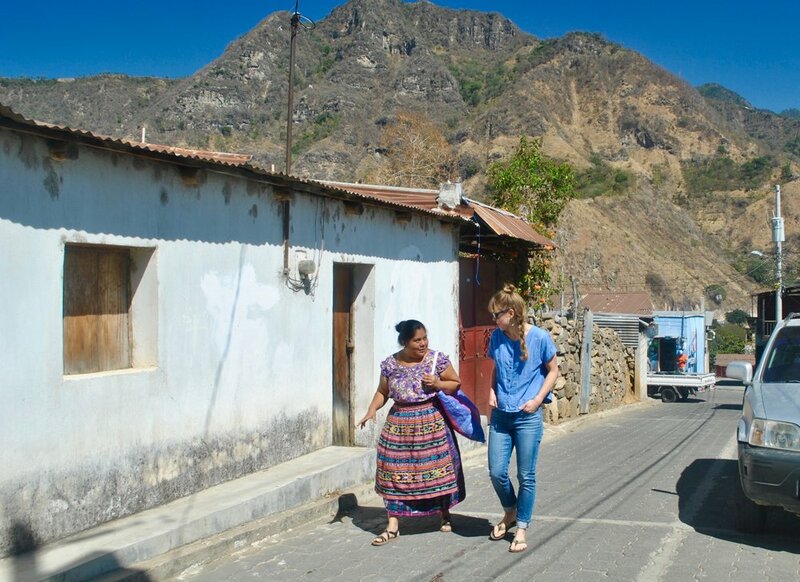 Amalia (President of our partner artisan cooperative in San Juan, Guatemala) walking with Amanda Zehner (Founder & CEO) to pick up products from one of our partner artisans. On Monday morning, we met with the GW graduate students to go over what questions they would be asking our artisans and suggested question phrasing variations that might be better understood by our artisans. We then sent them on their way to artisans’ homes for their first interviews and headed to meet with Amalia again. It is moments like these that remind us just how impactful and important it is to spend time working side-by-side with our artisans. It can be challenging to communicate across borders, let alone in another language. These face-to-face conversations not only strengthen our relationships with our artisans over seas but also help us to clarify confusion or misunderstandings in product designs. After working together through the complete clutch construction process, we headed home for dinner and called it a night. Amanda Zehner (Founder & CEO) and Amalia (President of our parter cooperative) going over translator schedules for interviews. Amanda Zehner (Founder & CEO) getting ready to board the shuttle boat from San Pedro to Santiago. 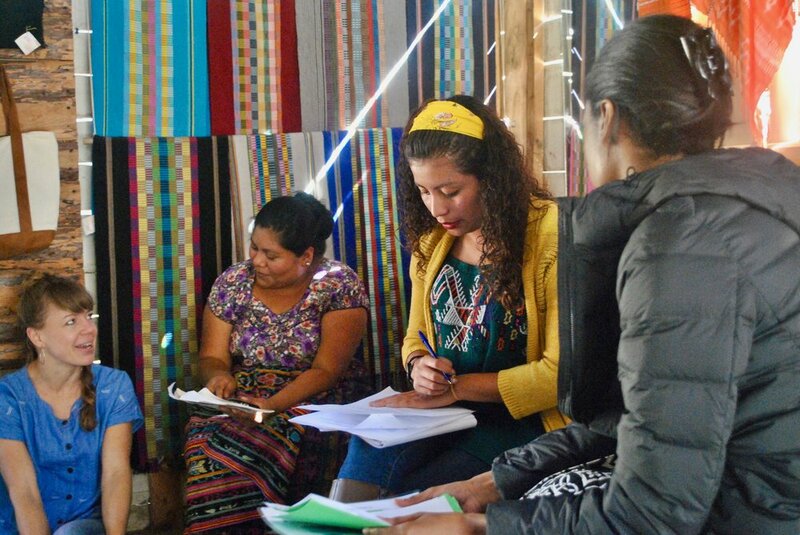 Amanda Zehner (Founder & CEO) sitting down with the Mother Artisan Group at La Puerta Abierta Learning Center. Having not seen Ana or Amanda since our event in DC in late January, our lunch together was quite the reunion! After catching up a bit, Amanda told us about her plans to expand La Puerta Abierta to a new piece of land she’d just purchased down the street from their current location. Since La Puerta Abierta has always functioned off of land that had been lent to them, this news meant that the community hub would finally have a permanent home, bringing more security to the abundance of children who currently seek education from the learning center in addition to the mothers group that convenes there to create some of our products. Three of our U.S.-based members, Amanda Zehner (CEO & Founder), Lyn (seamstress extraordinaire), and Brooke Olefson (Living Threads Co. Intern) were joined by a group of four International Development Graduate students from The George Washington University on this journey abroad. On Sunday, post-breakfast and coffee in Antigua, we hopped on a bus for a four hour drive to San Juan, where one of our partner artisan cooperatives is located. Once we arrived in San Juan, we quickly settled into our Airbnb, made our way through the narrow cobblestone roads with the GW grad students, and sat down with Amalia, the President of Tinte Maya Artisan Cooperative, to go over what we had planned for the upcoming week. After the GW graduate students had firmed up their scheduled interviews with our partner artisans, we brainstormed new product ideas with Amalia and contemplated how we might go about bringing them to life. We explored some of their artisan members’ new work, found items we were inspired by, and talked about how we could incorporate them into our products. Quality control, communication of designs, and scaling production were all topics of discussion. With Amalia’s help, we developed new formats for product-making instructions and learned a bit more about the weaving process which, in turn, allowed us to understand how to better specify details for our artisans. After a few hours at Tinte Maya, we headed out for dinner at the only open restaurant in town, regardless of the city-wide power outage. Together, we decompressed from the busy day over salsa and cerveza before heading back to our Airbnb to get some rest. Tinte Maya Artisan, Alejandra, and her daughter. The following morning was spent taking photographs of our artisans for a new packaging idea we’ve been working on. Not an every day occasion in San Juan, many of the women took this opportunity to get dressed up for formal photos, reminding us of the simple opportunities, like having a nice photo of ourself, we so often take for granted. We snapped each smile and every smirk, thanked our artisans for their time and hard work and walked back down the hill, between the colorful graffiti-coated walls, to our cooperative’s workshop. Here we met the GW graduate students after their interviews to check in on the interview process, questions and experience thus far. 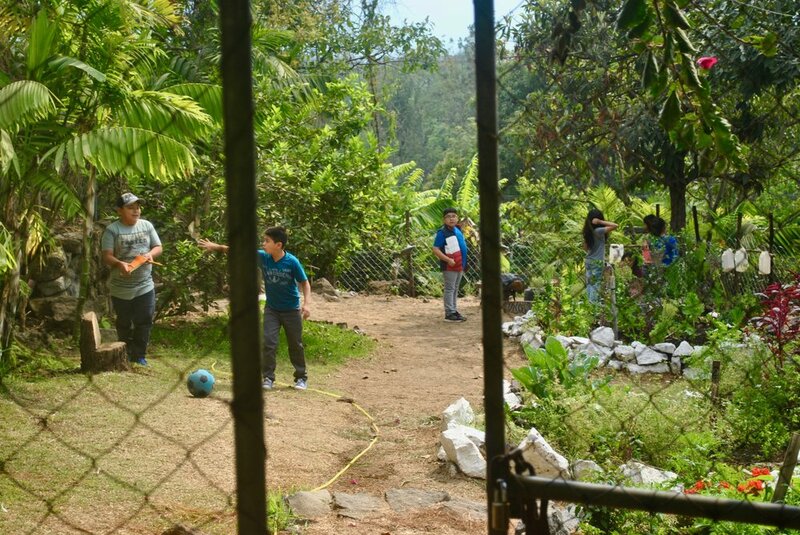 Students playing in the garden at La Puerta Abierta Learning Center. Early Wednesday morning, we hopped in a tuk-tuk and skid through the winding roads around Lake Atitlan from San Juan to San Pedro. We sat down at a local cafe for a quick cup of coffee and a bite to eat before boarding a shuttle boat to Santiago. About an hour later, we were in Santiago, walking through the bustling streets, exploring the brightly colored markets, and checking out the incredible architecture that happily lent itself to the majestic mountains and volcanoes surrounding the little town. Once we got a better handle on our whereabouts, we found our way to lunch with Amanda Flayer (Founder of La Puerta Abierta Atitlan Learning Center), Ana Mesia (Mother Artisan and Teacher at La Puerta Abierta Atitlan), and Ana’s two children. Local preparing to board the shuttle boat at Lake Atitlan in Santiago. Amanda Zehner (Founder & CEO) discussing product development with Amalia and Alejandra at Tinte Maya. A group of women walking in Santiago, Guatemala. After lunch, we headed up the hill with Amanda and Ana to La Puerta Abierta, where we payed a visit to the mother artisan group we work with and discussed new products we’d like them to work on. The group had prepared some beautiful embroidered designs based off our sketches. After discussing slight alterations we’d like to make, we sat down with the women to learn a bit more about each of their lives. We went in a circle and talked about what products each of the women worked on, what drew them to La Puerta Abierta and, in turn, Living Threads Co. It was both empowering and humbling to have a conversation with this group of women who, through their work at La Puerta Abierta, are giving their children access to education and bettering their own livelihoods while also maintaining traditional artisan crafts like backstrap loom weaving and embroidery. Post-meeting at La Puerta Abierta, we headed to the shuttle boats to hitch a ride back to San Juan. Once we arrived, we went to our Aribnb to prepare for our travels the following day. On the morning of Thursday March 14th, we toted our packed bags back up the winding cobble stone roads. We met with Amalia one last time to go over last minute thoughts and product changes prior to boarding another small boat to Panajachel, where we would be briefly meeting with a seamstress group to discuss our new clutches. After our stop in Panajachel, we hailed a bus back to Antigua for the last night of our journey. We arrived in Antigua late in the afternoon, checked into our hotel on the border of the main square, and walked around the city for the last time before our departure. Over dinner, we reflected on what we had gotten out of this trip, the tasks we had accomplished, and what we needed to get done upon our return to the U.S. After consuming our final homemade tortillas with dollops of fresh guacamole laid atop, we bid Guatemala, along with all of its incredible people and culture, adieu… until next time. The streets of San Juan, Guatemala. It is trips like these, where we have the ability to meet with our artisans and expand our relationships beyond a phone line or an email thread, that remind us of the meaning behind the work we do here at Living Threads Co. At times, this business can feel stressful and overwhelming, but the impact we have, an impact that transcends borders and language, an impact that transcends place and time, makes the effort worth it. So, thank you— thank you to all of our loyal customers who show us their endless support and love for this company. Just as Living Threads Co. would not be possible without our talented artisans, it would not be possible without you either.